The 25-room boutique Ibiza Rocks House at Pikes, is home to the bands and DJs playing Ibiza Rocks each week and last summer Idris Elba joined the party and upped the ante with a run of parties that saw special guests such as Pete Tong, Gorgon City and Doorly join him week on week to create some great throughout the summer. 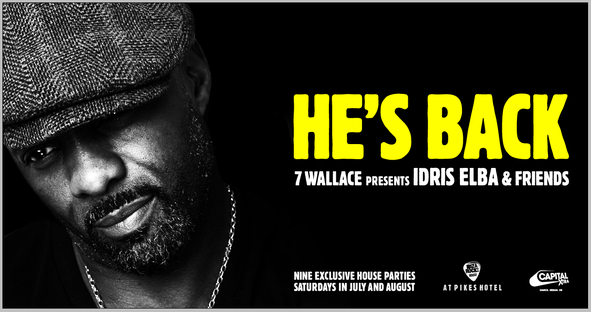 Back for round two, Idris will host nine Saturday night House parties from 5 July – 30 August as 7 Wallace presents Idris Elba & Friends at Ibiza Rocks House at Pikes. A second run of parties is a true testament to Idris Elba’s love of music, his love of Ibiza Rocks House and his love of Ibiza. The 7 Wallace parties are intimate and understated with no cover charge, just a house party vibe full of individuality and seeped in music history. 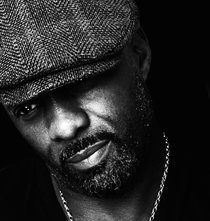 As the sun goes down, Idris Elba will once again turn up the heat at the Idris will take the reigns and get behind the decks for a special summer residency. Idris Elba said: "I'm back! I went IN last year and I'm going IN Again! "IDRIS IS IBIZA" - the T shirt coming soon :)." The hotel’s ‘Freddie’s’ suite, famous for hosting Freddie Mercury’s 41st birthday bash, is decadent and apparently at the heart of Ibiza after-dark activity for those in the know. It’s here that Idris will set up home and do his ‘7 Wallace’ thing, bringing together his love of throwing a great party and bringing friends and unannounced names to spin and party alongside him. He may be best known for his Golden Globe-winning turn in Luther or as Stringer Bell in The Wire, or as Nelson Mandela in the biopic Mandela: Long Walk To Freedom, but music seeps through his soul. Idris Elba will also be playing a special set at Ibiza Rocks House at Pacha this summer (28/07) and selected dates at Ibiza Rocks Bar, San Antonio. Download Idris Elba - Look With Your Ears Vol.2" on Soundcloud below.